At a time when heroes and villains are very much in South Africa’s spotlight, it’s worth dwelling on Mossel Bay-born, Andrew Beauchamp-Proctor who featured in UK media this weekend. 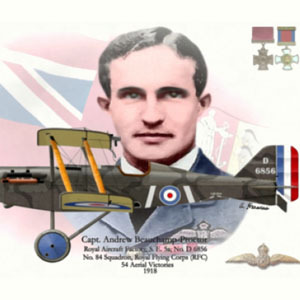 The SACS old boy, a First World War flying ace, is in the news because his Victoria Cross is to become the 200th VC on display at London’s Imperial War Museum. After helping defeat the Germans in then South West Africa, the diminutive (5ft 2in) Proctor re-enlisted in March 1917, volunteering for the fledgling Royal Flying Corps. In just eight months of combat flying during 1918, Proctor wracked up 54 “kills” making him the 6th most successful Allied pilot, with only two Germans scoring higher. Because of his stature, wooden blocks had to be added to the plane’s controls, affecting his flying skills. But Proctor overcame that disadvantage with a deadly shot and plenty of guts, winning one of the very first DFCs and then his VC, a medal awarded only to “the bravest of the brave”. 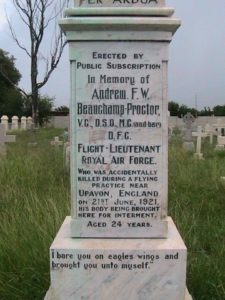 After a year’s holiday at home to complete his engineering degree at UCT, the decorated Captain Proctor returned to what had become the Royal Air Force, but died when his plane stalled in a training flight. Proctor, who only lived to 26, is buried in Mafikeng where he was given a State Funeral in 1921. But his courage inspired many who followed. As will modern day heroes like Pravin Gordhan, Thuli Madonsela, Mcebisi Jonas and Vytjie Mentor who are also standing up to dark forces. Like Proctor, their straight spines and hearts of lions are a credit to the nation.